Please backup your database before doing any kind of major work on your forum/board. In this guide we will use "Ocean" skin as an example. Unzip the .zip file on your computer and you will see the folders as below. Inside "Ocean" folder you will find ... Misc (PSD's etc ..), Read Me, styles and XML folder. Upload style folder to the server. Using a FTP client login to your server. Go to the (root) folder of your forum. (You should see "admincp", "archive" etc in that folders). 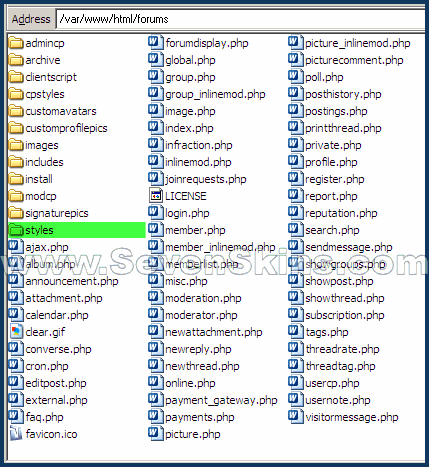 Upload only the "styles" to the root folder of your forum. To install new style log into the admin control panel. 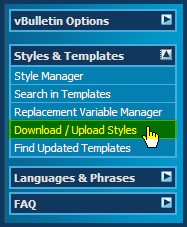 Expand Styles & Templates and click on Download / Upload styles. (See Screen shot below). Follow the steps in the screen shot below and upload the XML file. 1. 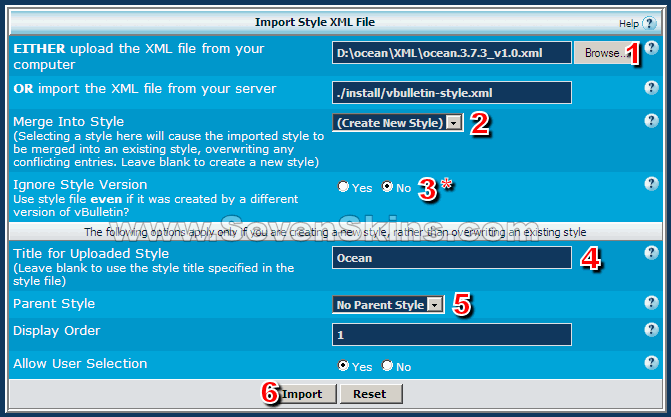 Browse for the XML file in ocean skin's XML folder. 2. Select create new style. 3. Ignore style version. (If you get version number error you will have to select "YES"). 4. Title for uploaded style. After importing the XML file skin installation is finished. Support will be offered to the customers who have purchased the skins and it is available at forum. Support will not given in the open forum, PM's or emails. Support cannot be offered for modified skins or questions on how to modify the skins or for third party software such as vBadvanced CMPS, vbPortal etc. If you need support for these softwares you would need to contact them. Before creating a new post, please read through all the posted FAQ's and search forums as your query might have been answered.